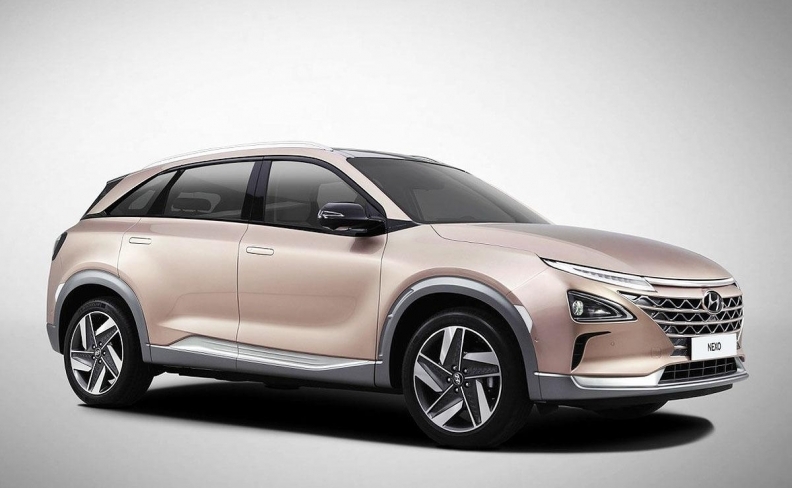 Hyundai Canada has confirmed the hydrogen fuel-cell Nexo will arrive in Canada by the end of 2018. The first of six planned, publicly available hydrogen refuelling stations is now open in British Columbia, much to the delight of Hyundai, Honda and Toyota which have plans to sell hydrogen fuel-cell vehicles in Canada. The station at 8686 Granville St. in Vancouver opened with both automakers present on June 15. It’s operated by oil and gas giant Shell and Hydrogen Technology & Energy Corporation (HTEC), which isbuilding a six-station network in Greater Vancouver and Victoria. Shell will partner with HTEC on three of the stations. Fuel cell vehicles don’t require gasoline, but instead run on advanced fuel cell technology that uses hydrogen. When hydrogen and oxygen from the atmosphere are combined into the vehicle’s fuel cell stack, electricity is produced through an electrochemical reaction. The only byproducts of the process are electricity and water vapour, resulting in vehicles that yield zero-emissions. The Hyundai Nexo can be refuelled in as few as 10 minutes and has a range of about 600 kilometres on the highway. Honda began basic research on fuel cells as early as the late 1980s. In 2016, the automaker debuted the Clarity fuel cell vehicle. While Honda said in a statement that it believes hydrogen fuel-cell electric vehicles “have the potential to be an important part of a future low-carbon transport system,” the hydrogen version of the Clarity isn’t available in Canada. Honda offers the Clarity with three different powertrains: hydrogen fuel-cell hatchback; plug-in hybrid; and battery-electric. Only the plug-in is available in Canada at the moment. Honda has stated its support for hydrogen technology and for the infrastructure being built to help popularize fuel cell vehicles “but we have not announced any intention to bring the Clarity Fuel Cell to Canada at this time,” a spokesman said in a statement to Automotive News Canada. Toyota Canada also had representatives and two fuel-cell Mirai sedans on hand in Vancouver, where the automaker was offering test drives. The Vancouver station is the second piece of Canadian hydrogen infrastructure to be announced this month. Quebec City’s first hydrogen refuelling station is expected to be fully operational by the spring of 2019, the Province of Quebec and Toyota Canada said on June 13. While the entire station might not be fully functional by the end of 2018, the pilot project will at least allow the Government of Québec to start using its first fleet of 50 Toyota Mirai fuel cell electric vehicles on the roads of the province toward the end of this year.